If R.R. Hunsinger had grown up in another era, He would have been one of the kids with a slingshot in his back pocket, slouch cap, with a trailing dog running along a dirt track trying to find glass cola bottles to exchange for nickels so he could go catch the matinee. He has been in love with all things Saturday Matinee goodness since seeing Errol Flynn welcoming Olivia De Havilland to Sherwood Forest. This love brought him to the old pulps with The Shadow, Solomon Kane, and Sam Spade. R.R.Hunsinger has previously appeared in Pirate Versus Monsters from Pro Se and in his own Erlik’s Saga from Four Fools Press. R.R. Hunsinger lives in North Carolina with his faithful hound and yeah he has the slouch cap and been known to use a slingshot from time to time. Pirate! Scoundrels. Rogues. Masters of the Oceans! Men and women unafraid to challenge the dangers of the sea and the unknown! Monster! Images erupt in the mind! Vampires, zombies, werebeasts. Creatures hiding below the waves and striking from high above the clouds. And now the best authors today bring together two of the most beloved characters in Genre Fiction in Pro Se Productions’ Pirates Versus Monsters! Authors Neal Privett, Raulston Hunsinger, Dale Glaser, Mattherw Martin, Jacob Milnestein, and Jason Norton take creatures of nightmare and the terrors of the seas and throw them together in veritable storms of action and adventure! 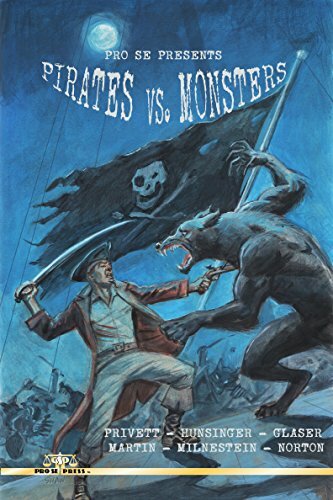 Find out who wins in Pirates Versus Monsters! From Pro Se Produdtions.